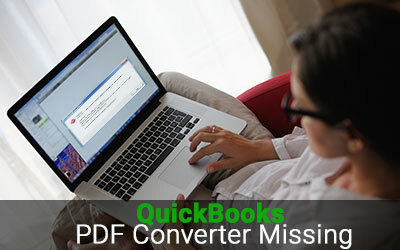 The PDF converter issue while using QuickBooks may come in different ways. You may get the messages like PDF Converter shows offline, unable to save as .pdf file, and missing pdf file component etc. It may, certainly, appear to be quite embarrassing to many of the new users that are not well familiar with such QuickBooks issues. The point of worry is that how pdf converter can go missing today if it was there yesterday functioning without any problem. However, this is not an inscrutable issue. Moreover, there are several solutions for this issue. You may have never tried to use any troubleshooting methods, but that should not stop you from doing it. The troubleshooting methods are easy and simple. QuickBooks Print and PDF Repair Tool: For this, you can visit the official QuickBooks support site and download the QuickBooks Print and PDF Repair Tool. It is pretty simple to do so. Like any other application, you can download and run to install it. Once the installation is complete, you can try performing the pdf file related task that failed last time. If the problem persists, you can reboot your computer and try performing the task again. Check if the XPS Document Writer is working properly. If something is wrong with, uninstall and reinstall the Microsoft XPS Document Writer. It is possible that the current error is occurring due to the incorrect security settings. Open the security software or the antivirus you have installed on your computer and edit the settings. Login to Windows with Administrator rights and open the window for Printers and Faxes. Find QuickBooks PDF Converter. Right click on the QuickBooks PDF Converter and find ‘Delete’ from the drop down menu. Choose ‘Delete’ and press ‘Yes’. Visit the official Intuit site and download and reinstall QuickBooks PDF Converter and perform that pdf related task that failed earlier. You will, most probably, be able to resolve the issue if you take the above mentioned steps. If you fail to do so, you should surely get in touch with QuickBooks experts for support.